For as long as there is printed media, or radio stations, or television there will always be deadlines. You could have the best story in the world... but you get it in late and it is worthless. Now this may be an outmoded concept in a few years time. And indeed it is arguably an already outdated idea for internet news bulletins but for everyone else it is still useful. There is nothing like the pressure of a deadline to concentrate the mind. The news editor breathing down your neck can - oddly - bring clarity and focus to your work. No more worrying about the right choice of words for your intros - just get the bloody thing written, broadcast, read. And do not think that because a final deadline is, say 7pm, that's when you have until to write it. Unless you are writing the splash it's often a lot earlier. Even on weeklies there has to be a steady flow of copy coming through. Those sub-editors don't come in just to eat their packed lunches. So if out on a job - especially if you are working for a daily - keep a constant eye on the time. Don't forget to report in - but not too often - when you have a significant line or there has been a major development (apart from any thing else your story could be moved up the list). If working fresh on a story allow yourself at least 20 minutes before the deadline to write your copy. If you are working on a developing story start writing before you get there. But that is breaking news. For the most part that is not the case. It is just filling in the bread and butter stories that is an issue. Again this is why diaries are often useful. They allow a paper to propel itself into the forthcoming week - even if nothing much is happening on the patch. Cary Grant plays the cynical newspaper editor trying to hold on to his ace reporter - who also happens to be his ex-wife. 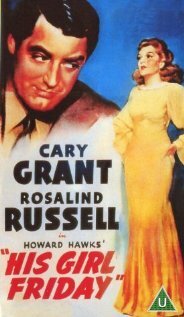 Sounds cheesy but under Howard Hawks's direction it is hilarious and fast-paced. And there's some great lines about journalism. It is based on a 1929 play The Front Page - which was adapted into another movie in 1974... called The Front Page. Anyway if you are interested you can buy the movie from Amazon - which, you see, is my effort at advertising.